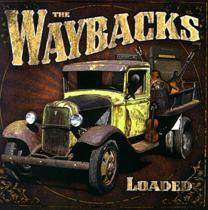 George Graham Reviews The Waybacks' "Loaded"
Bands very often outlive the tenure of the members, as some members leave and are replaced by others. Not many bands live our their whole existence with the same personnel. So it's interesting to consider how much a band's sound will be altered when members change, especially if you're a fan of the previous incarnation of the group. This week, we have an example. It's the new CD by the San Francisco-based band called the Waybacks, which bears the title Loaded. The Waybacks were formed in the Bay area in 1999 by guitarist James Nash, who was born and raised in Nashville, but had moved to the San Francisco area. He had specialized on electric guitar, but was invited to participate in what was supposed to be a one-off acoustic project. He found playing the acoustic guitar "liberating" as he described it, on the tour that band was doing. The group, calling themselves the Waybacks, settled into a blend of impressive acoustic playing with sometimes tongue-in-cheek lyrics. They blended traditional fiddle tunes with their interpretations of bebop jazz compositions, and included a number of songs with humorous lyrics. They released three independent CDs before being signed to the Nashville-based independent label Compass Records, and released From the Pasture to the Future in 2006. They also developed an association with the Grateful Dead's Bob Weir, and have toured frequently with Weir's band, attracting the jam-band crowd. In the past two years, the Waybacks have gone through some personnel changes, with long-time guitarist, vocalist and songwriter Stevie Coyle leaving to pursue a solo career, and the introduction of 24-year-old fiddler Warren Hood, son of a well-known Texas musician, Champ Hood. The younger Hood was just in the process of joining the Waybacks when their previous CD came out, which had guest appearances by three different fiddle players. Hood also has settled in as a prolific songwriter, having penned about half the new recording's music. The Waybacks have gone essentially from a quintet to a quartet, with drummer Chuck Hamilton and bassist Joe Kyle, Jr., rounding out the group. The result of the personnel changes, at least as heard on their new CD Loaded, is a somewhat less eclectic and boisterous sound, evolving from being a New-Acoustic-influenced jam band with as many instrumentals as vocals on their last CD, to more of a rootsy rock band, with some acoustic instrumentation and a much greater emphasis on vocals and songs with stories. There is only one instrumental on the new CD. But the whimsical quality of the music is not all gone, just scaled back some. And they are still impressive in what they do. They traveled to Nashville to record. Loaded was produced by bluegrass bassist Byron House, and features a number of Nashville players sitting in for guest appearances, including Newgrass Revival founder Sam Bush on mandolin, steel guitar player Cindy Cashdollar, former Stevie Ray Vaughan keyboard player Reese Wynans, and vocal support from members of the bluegrass bands The Green Cards and the Infamous Stringdusters. Though the Waybacks' instrumental sound is a bit more constant this time, there still is a fairly wide range of influences, from roots rock, to jazz from the swing era, to some Memphis soul influence. And there are some lyrically interesting pieces, including one that is more or less about global warming. While Loaded, the new CD by the Waybacks, is a bit less wide-ranging and whimsical than their previous album, it's nevertheless a worthwhile and engaging recording of intelligently-written original music that still does incorporate more styles that you are likely to hear from most rock bands. The playing and vocals are first rate, and the Nashville recording seemed to work well for this San Francisco area band. Our grade for sound quality is about an A-minus. The mix is quite good, and generally tastefully understated. The dynamic range is a perhaps a bit better than most rock albums in preserving the differences between loud and soft, but it still could have been better. The downsized and perhaps slightly less ambitious edition of the Waybacks nevertheless have made a classy album that's nothing to be ashamed of.